Have you ever desired to be a god in the minecraft world, giving you the ability to create? Then the mod you are looking for is the Craftable Animals mod. Once you install this application, you not only have the ability to create your own weapons and houses but you will now have the power to create your own animals. The Craftable animals mod which is easy to use gives you the ability to create vanilla animals using a very impressive crafting template from other animals in your minecraft game droppings. This mod therefore gives you the ability to create your own unique animals which would be peculiar to only your own minecraft game and might not be found on any other minecraft game anywhere in the world no matter the number of mods such users are able to install. These animals will add to the beauty and fun of you game. You would also be able to beat your chest as a creator of not just mere structures and weapons which any other person can create, even in the physical world, but as a creator of animals based on your creativity and imaginations. To install the craftable animal mod, you will have to download the craftable animal mod application from the Internet, after which you use a file compression software such as winrar or 7zip to extract the contents. You would also need to download and install the modloader software to be able easily install this application. You then locate the minecraft.jar folder by clicking your windows start menu and running the %appdata% software. Once this is opened, you locate the .minecraft folder and click on it. 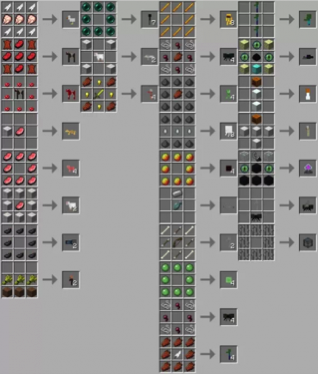 You then click on the bin folder and access the minecraft.jar. You can then drag your files into the minecraft.jar folder and you are good to go. All that is required of you now is to run your minecraft game window and start creating your own fantastic animals to add to your collection of animals. If you also want other new readymade animals, you could also consider installing the MO Creatures mod.